A blog is a good blog, only when the blog is having good visitors(readers) and more important visitors are getting satisfied from your blog articles, your motive of blogging should be help others, no matter what you are sharing on your blog, I think it is the best way to promote your blog. See internet is the best source to show your talents, because internet is always looking(thrust) for talented people and what I am going to tell, that is little bit more interesting, yes my dear more interesting. Blogging is the best way to full fill the thrust of the internet, see blogging can not make you millionaire or billionaire in the over night or may be in one month, but of course it can make you more than of this even, but you have to keep blogging at least for a year and see where you are, but remember don't do time pass in blogging. Blog directories are good to get visitors to your blog, but I will suggest to submit your blog to blog directories(I found very good 85 blog directories), you can submit your blog to these directories to get good visitors also get back links, among of these I will suggest to submit your blog to www.bloggers.com, this blog directory having unique feature that is they provide back links(automatic) for your each blog post, even you can see those back links on Google also, this way your blog back links will increase and more back links means more traffic and good reputation of your blog. Now, I am going to share with one more tips, which I am using for my blog, actually as you know I am from India, so I usually share my blog post on www.indiblogger.in, to get more visitors to my blog, you can also share your blog post on your own countries blog directories to get traffic like I do. Now come to the main source of getting traffic, that source are search engines, the most power full way to getting traffic from search engines by setting proper search engine optimization for your blog, see search engine optimization is not a one day job it takes time to implement and also getting results but the main important is write great article. Commenting on other blogs to get back links as well as getting traffic is a old strategy, I think it's a evergreen strategy, but you must know how to comment on blogs to get traffic from other blogs, Don't Spam dear, without spamming also you will get back link to your blog for commenting, traffic too, then why should you do spam comments. Always write great comment, to write great comment you also have to read the blog post, so always read other blog post, if you want to improve your knowledge, knowledge is most important in blogging. Great content always work, yes this is really work, because great content like both search engines as well as people(readers), so always take care about your blog post, if you want to become a great blogger then you have to do hard work, only hard work make you to write a great blog post, so always put effort to write a blog post. Content is great man, it is the best way to make yourself king of blogging world, because "content is king", even founder of Microsoft Bill Gates said this. Title almost play important role to get traffic from search engines, because if you will give title name of your blog post, on same title if people are searching on search engines, then definitely you will drive more traffic to your blog. So, now may be you are thinking how would you think that what exactly people are searching on the web. One more thing I would like to share with you do repeat keywords, those keywords you have written on your blog post title and see the traffic coming to your blog. I am 100% sure this will work, do it and tell me your results! When it comes to blogging, now a days it is becoming really difficult to rank well on search engines the reason is simple "number of blogs". There are million those wanted to become famous blogger, then how would you become different than other bloggers on same niche? Actually, above five reasons are good, but need to implement few other tips and tricks, well I said this a New Age Tips and Tricks. I hope you have account on Facebook, Twitter and Google Plus right then don't waste your time while chatting on Facebook on un-necessary topics with friends. Just promote your blog post on these social media, I know it will help you to get good traffic, well here I am going to share with one very good tip to get instant really traffic to your blog. 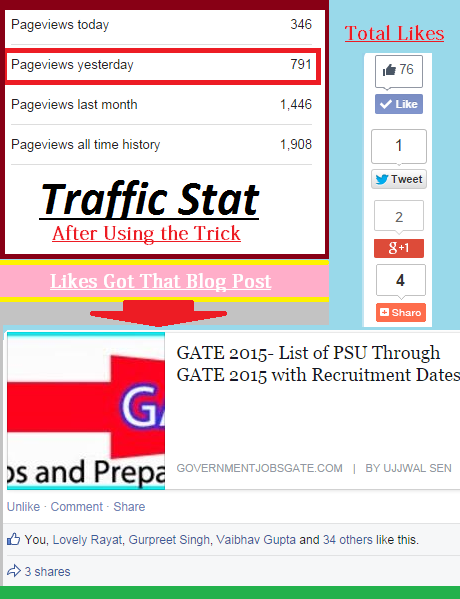 Since, I have used social media, one of the great thing happened to my blog post that is sharing my blog post on Facebook. I hope may be you are interested to know how is it possible? May be you also wanted to know, is this is possible for any blog post? Then my answer is YES! This is possible but only you need to have good friends on Facebook and your blog topics should be related to your friends interest. Write Good Blog Posts- Yes, it always put good impact if you are writing great content but don't forget to proof read your blog post before live. Add High Quality Image- Images always attract, but need to optimize images for search engines for life time help. Tag Friends- This is BIG man, don't forget to tag friends but tag friends if only your blog post is useful for them, otherwise don't tag them, because it may be irritating for them. Like Yourself- Just after sharing your blog post on Your Facebook wall like yourself the blog post it will increase audience reach on Facebook. Knowledge- Only you can write great piece of content, wait if you have knowledge about that topic. see there are many ways to get knowledge like reading competitors blog, experimenting, reading books also. But real knowledge always come from experiment, because there we come to know about the real things whether your knowledge is working or not. Patience- If you have patience then you can achieve anything in this world because BIG Dreams always takes time that's why its value is more than things to achieve takes less time just like cooking fast food. Reading- If you want to become a good writer then you need to become a good reader first because reading and writing both are directly proportional to readers like. Presentation Style- In this world everybody is unique that means, no matter what you are going to do that will be unique but here you need to copy few things like writing style and way of putting images in the blog posts. Eagerness- You must be curious as well as crazy for helping others and again don't try to cover all topics rather try to cover two to three topics and provide depth knowledge about those topics this is really works in blogging. If you are thinking about getting highly qualified traffic to your blog then you need to optimize your blog for search engines like Google, Yahoo and also Bing. These three search engines having great potential to make you rich enough, but again you need to put effort for getting traffic. I mean few tips and tricks you need to implement, although I have recently an article under title- SEO Tips for Blogger. Other than these, I am going to share with you Six SEO tips those will help you to get traffic to your blog. Title of the Blog Post- Choose title wisely after all people first read title of the blog post then they read the blog post, so make your title attractive as well as useful for people but should be related to content inside the blog post. Keyword Density- You should use keywords in the article but don't use over, just try to maintain about 3% it will be helpful. Content Length- Valuable content with good length always get good rank, I am saying this- I got this data after looking as well as from my personal experience of five years in blogging. Heading- In between the article you must use headings, like I have used it will help more to get good traffic. Have you ever think about "People Add People to a Community"
If you are really providing great, useful, unique, beneficial, good for people content then it becomes easy to go viral. Once your blog post goes viral, I mean think about this your blog post will be in news may be index by Google News or Facebook Trending, Google Trending. If you wanted to see that day then you need to go through these steps may be you need to implement few other unique steps those would be unique that's why it will work like nothing. I mean ultimately you can achieve your goal through blogging. Now a days people are King, if anyhow you can make them happy through your blog then your work ends others thing will be followed from people like Fan, Money, Authority and what Not? Again, it takes time as well as effort. Since, 2nd year of Engineering these two things are my great friend probably because of this today I am Happy. And I know because of these two things I will be happy. I am going to share with you those are just amazing but most of the bloggers just don't use these ways, may be because of this they unable to get good visitors and later on they quit blogging. Distribute Free T-Shirts- This tips really works to get good traffic "actually I got this tips from Shoemoney". Back Side of Taxi- Those taxi are used as a tourist vehicle you need to talk to them for adding your ads on their taxi back sides its cheap but effective. Students Points- Find out where students usually spend time like Book Shops, Fast Food may be other places try to put your blog ads there. Flex Near to Bus Stands- Putting flex about your blog on high density people place is the recent trend of out door advertising, that's works awesome but investment is needed, don't use this method if your pocket does not allowed. Seminars in College- I have implement this method during technical fest in my college, I got prize for that and also got traffic. Writing Books- May be you know I have written three e-books on Amazon, yes it helps me to get good traffic because few websites index writers profile. I have talk about this couple of times in my blog posts, because its really important, see search engines, social media, directory works just awesome for getting traffic to blog. But, what else if you are thinking about consistent readers to your blog without these sources then I must say as well as recommend you to use E-mail marketing for getting readers to your blog consistently. Saying, when I have started blogging this was my biggest mistakes, because I did not collect my readers e-mail contacts. I have started collecting e-mail contacts from last two years and I am getting great result from this, I hope you will get good results too. All come to blog post title, if no one is reading your blog then there is some thing wrong with your blog posts, one most common mistakes I am going to tell that is proof reading, I mean read your blog post before clicking on the publish button, if you found any mistake then correct it quickly before publishing it. Now come to best part, write your blog post, as you are talking to a person, make your blog post interesting by adding images, which will bring more traffic to your blog through image searches. Is there anything else can Get you readers for Blog?